Since I arrived in Paris a while back, a number of food tendances have slipped into our vocabulary. From appetizers served in Chinese-style spoons, to the alarming addition of adding sugar to savory hors d’oeuvres, I’ve learned to become diplomatic when faced with a plate lined with white porcelain spoons with a dollop of minted pea puree topped with a touch of crème fraîche and three salmon eggs in the middle, or a beef cubes dipped in caramel and garnished with a raw quail egg and a strawberry-flavored marshmallow. But I’m still having a little trouble with slate plates. And I’m not the only one. I don’t know when they started, but perhaps it was because the transition was slow, so that I barely noticed them rockin’ the tables. At first, it made sense: You have cheese or charcuterie, both rustic products from the earth, so offering them forth on a sturdy rectangle of material which shares the same humble beginnings seems like a natural coincidence. But then things kind of got out of hand. But what has taken off in Paris are les assiettes d’ardoise, and I’m not sure the waiters – or diners – are all that much happier. For one thing, if you’ve ever watched a garcon reaching far across a table, trying to pry a flat piece of stone off of a flat table top, you can almost hear the cracking fingernails as they try to dig their digits underneath the weighty stone. I did a little digging – although not with my fingernails – and saw that perhaps the trend started in Spain, (or Germany, or England, or Chichester, or Norway, or somewhere else), then percolated up and over to Paris. But it sets my teeth on edge if I have to scrape a knife across the surface of a slab of slate, trying to cut my steak frites with a serrated blade and listen to it rake cross the surface of the “plate.” Honestly, the noise and sensation makes fingernails scraping a chalkboard feel as soothing as a Karen Carpenter song in comparison. In spite of my scratchings here about the subject, I’m sure no one who’s in a position to do anything about slate plates is reading my concerns. But if they are, it’s not too late to stop. We’ve already had at least one stone age, so perhaps it’s about time for another – and then, at last, this one can be long forgotten. Because I’m sure when the next 10,000 years pass and scientists dig up our remains, and find rectangles of the raw stones that we’ve been eating off of, they’ll be scratching their heads. But at least they won’t be scratching their plates anymore. At least I hope for their sake they’re not. Isn’t the stone porous? How sanitary could that be? I’ll be they aren’t dishwasher safe. Seriously? Whats a daft trend. I know I’ll end up a dinner party of some yuppie foodie friends that paid 50 euro each for a range of slate platters or plates. They could have simply asked for some of the ones that come loose from my roof for free, on the promise they never subscribe to such a impractical trend again. It really does put a spin on earthenware. I haven’t yet had the displeasure. I have heard of cooking on slate, and that did interest me. I think that, I need the frictionless slide of a glazed plate to enjoy my food. Would it be rude to ask the server that one’s food be served on a glazed ceramic plate? Perhaps it would put an end to this trend. i bought myself a round plate like that years ago. i thought it was actually a candle plate but though my food would look good on that for the photos. but then i started noticing them all over vienna, italy, south france etc. everyone is serving food on those stone plates. i find them nice to see but i am not too excited about eating from them. I saw a set of those on Wilma’s wedding registry many years ago. I would not want to eat off of a slate plate! Just imagining the grating sounds of forks and knives makes me cringe and shutter! Charcuterie and cheese served on one is fabulous. Cooking on slate is great. I keep slate tiles in the bottom of my oven to even out the heat distribution. Maybe this is taking the whole “green” thing a little too far? I’ve eaten meat cooked on a hot stone (ishi-yaki) in a Japanese restaurant before, but that’s a bit different than serving your entree on a slab of slate! Maybe one day they will take it a step further and make slate tables where the waiter serves your food directly on your table? Now that would be something to see! I don’t know, I think it looks kind of cool! I haven’t seen it used anywhere before so to me it’s looks like a creative touch. Colorful foods on a black surface is very striking. I wouldn’t want to eat off of a bare stone, but I could imagine long leaves of romaine or a scattering of arugula or shards of red cabbage leaves as a bed on a slate platter used to serve finger foods on a buffet table. Like everything else, once a creative idea catches on, it gets done to death (and too often done poorly) until everyone is sick of it. It’s always fun to play around with a new idea, though. I work in the south of France in summer, and in the French Antilles in the winter. They’re ubiquitous these days, yes! And yes, it isn’t a good idea to serve things that need to be cut—the sound is truly sick-making. They aren’t dishwasher-safe, you have to handwash them. Our charter catamaran serves a maximum of 12 pax so that isn’t a big problem—I make sure I don’t use them for more than one course. Unless we are doing a dégustation dinner of 5-plus courses, then until my bosses buy me more plates, then oh well. We’ve not had a sanitary problem, but they are also not recommended for foods that are too acidic or oily (stains). We like them—the black background and rough edges are a nice aesthetic to make some dishes really ‘pop’, like a trio of verrines, or some dessert platings, or some Asian-inspired dishes. But yes, they are rather over-used (or p’raps, simply, misused) now sometimes. Still, they can be fun, and there’s nothing wrong with a bit o’ fun! How bizarre. I’ve never heard of this, and I don’t think I would particularly care for it. I’ll start keeping an eye out for this in the States. Agreed it’s awful. I hate having to cut things on it. I’m from London & here it’s the norm. Last weekend I was in Paris & ate at Chez Michel under your recomendation (it was fab!) but they served my terrine on a slate. Which to be honest is not as bad as the previous day when I was in the Bastille & was served my tartine from the boulangerie on a slate! Surely if anything it should be limited to poncy restaurants??! I do wonder how sanitary slate is when it’s used as a plate in a restaurant. I wouldn’t want to eat off unglazed slate after others had used the same plate numerous times…. I hope the trend didn’t start in Germany. It’s just so awful! I think it started in…..Holland! Or Spain? Austria perhaps? When I was in France this summer I realized how much slate plates have become a trend. And I would say, that the trend also has its origins, or at least its break-through in France. Nowhere else I have seen so many slate plates in restaurants, nor in home deco shops of all price levels. It does look fancy, but if they are all not dishwasher-safe (as mentioned by charterbot), I see a practical problem. Someone gave me a slate plate for serving cheese last Christmas. I didn’t know it existed before then. I think they got it at Williams Sonoma. I’m supposed to put several cheeses on it and write their names on it with a chalk. Since I don’t live in France, and it’s not my style to serve numerous cheeses, the thing has mostly been a piece of clutter. I tried to put cheese & crackers with grapes on it once but I felt I was pretending to be something I’m not. “Wipe the slate clean” comes to mind, but that referred to a chalkboard (slate-board), which, incidentally, always retains a residue. What exactly is the motive? Surely, the aesthetics can’t be it, as alternatives are cheaper and more pleasing. Customers have to reverse the trend. David, your description of the grating sound is much too realistic, it made my hair stand up on my neck and my teeth grate. I’ve seen them around here in Quebec, they are used in some bistros for cheese and charcuteries, but haven’t yet ascended to full fledged plate status. They are pretty and rugged, but after reading this the idea of eating a steak off of one will haunt me. I cringe at the thought of ruining any sort of knife trying to cut on a slab of rock! I agree, their use should be limited to meats, cheeses, etc. The plate has to actually enhance whatever is on it, but by using it simply because it’s “trendy”, it seems to deter from the food itself. I give the trend six months–the need to amortize the investment will be cancelled out by the inevitable breakage. 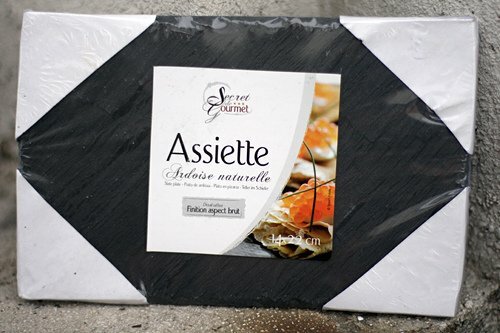 In the 90s I used slate roofing tiles (along with slabs of glass and driftwood for non-wet items) for my catering co. for assorted finger food things, which do look wonderful against the dark grey of slate. but we would assemble in the back kitchen and use wide offset spatulas to slide under and pick them up and place them where we needed to. We only had human dishwashers, but after wiping the slate with a dry cloth, we would scald with boiling water before reuse. I would never serve anything that needed utensils on slate, however. As someone said, things become trends without the folks in charge actually thinking them through. I worked in display at a major department store years ago, and Household and Gifts was one of my areas. As I was walking through one Autumn day, I noticed someone had left a bunch of dried out leaves on a table. I went to sweep them up, but hesitated. I looked closer; there were threads at the center of several piles. Then I saw the price tag – over twenty years ago, and the asking price for leaves stitched together like a child’s play bowl was $23.00. I don’t know if they sold many. I’ve been tortured by these for a few years now, alongside their cousin the inappropriate wooden breadboard. Since even Pizza Hut uses them you do hope their fortunes are on the wane. y suffit qu un imbecile lance une mode pour que les moutons de Panurge suivent…Apres les VERRINES, les MACARONS, les CUPCAKES vla les ARDOISES qui debarquent…. Slate plates have hit the tables here in Oz, too. I’ve not given them too much thought – except to wonder how porous they are and how long they would last in a commercial dishwasher – but then I don’t have to carry them around laden with food. I’m sure they are a fad and will pass. I’m more concerned with what’s on them! Ooooh! Someone who doesn’t like Karen Carpenter. At least she did not eat from slate plates. Oh, yeah. She just didn’t eat. On its slate-ware quite beautiful, but rather unpractical – unless you find sturdy and functional rubberized cutlery. Perhaps this trend spurred from the minimalistic design tide that hit Europe a couple of years back, but its implementation in food may be hazardous and as you point out – downright screechy! The last photograph is particularly assertive in exemplifying what anyone would rationally serve on slate: Fruits and other ‘finger’ foods! I would use caution though, as highly acidic foods can dissolve the mineral components in the stone… Not yummy at all. Hilarious as usual. Next, Rock Crystal wine goblets, carved by hand. Barbara: They indeed, can’t be run through the dishwasher (at least according to the back of the package shown) – which would draw the ire of many health departments. Am not sure how restaurants skirt the authorities…maybe that will be their demise. Lemon: In France, people tend to really run with trends. And once something starts (such as desserts with green tea or little spoons of food) it’s like a TGV train, and hard to stop. naomi: A friend did displays for a well-known store that was known for American-style. They had items like vintage golf clubs, trunks, and so forth scattered around the store which they used for displays. People started asking if they were for sale, so finally the stores started putting outrageous price tags on them. Putting price tags on leaves..and rocks would be the invariable next step? Ha. I must admit to owning two slate plates myself, I’ve had them for a number of years. I only use them to serve cheese and think they are lovely for that purpose, but serving steak on a rock seems a little out of hand. A few weeks ago in a restaurant one hour from Paris our main course were served on the mother of all slate-like flatware: a slice of marble. A big, thick slice of marble. Ridiculous. As a waitress who has to serve selected meals on slate plates, it’s the worst. Your hand has to perform contortionist activities just trying to sit the plate down without either spilling the food or breaking something. So, unfortunately, it has reached us down here in Australia too! :D Thank you for a good laugh, David! I like those plates when using them for cheese for example. But cutting a piece of steak on it? Never. Slate is for slashing one’s toes around the pool. Other than that, it’s not great for bathroom floors either – too slippery. But what’s missing is the artisanship that goes into fine porcelain or pottery created for dining. C’mon chefs, support your local ceramicist. Slate, marble and stones are great for displays, but cumbersome and really impractical for table service. We are also seeing Himalayan salt slabs used as both cooking and serving vessels here in the US. These are much more interesting than slate slabs although they are quite heavy too. Gorgeous with a big pillar candle on the edge of the fireplace in the kitchen – but not for the table. I love your blog! Your book “Sweet Life in Paris” was highly entertaining and a great read. I laughed out loud when the last time I was in Paris and witnessed the ‘cutting in line syndrome’ at grocery. I have often wondered where in the world your prized cookbooks ended up finding a new home. A renowned local Toronto chef, Michael Stadlander, used to do this kind of thing 20 years ago. 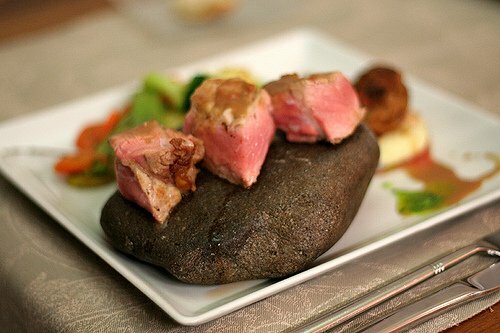 At a cooking class I took with ‘the master’, he served a dish on a large rock! I think it’s significant that I don’t remember the food, just the rock. I thought he must be kidding. People pilgrimage to his farm these days, and pay hundreds of dollars each to munch on leaves and berries under the trees on his property, so I guess there’s an ‘appetite’ for this sort of thing. Give me fine china any day. I have ‘evolved’! I spent a month in Angers this summer where ardoise is “mined”. There the slate is “king” and there it is even mandated that it MUST be used for all roofs. The cheese plate in restaurants invariably was served on the ardoise and it was beautiful to have that dark slate to showcase the light colored cheeses.It was usually used as a serving piece but I admit that besides having one dedicated to serving cheese I also have one on either side of the stove for setting hot pans! They were super inexpensive there at 7 euros for a 9×12 sheet. I’ve just come back from Paris. I dined at a very nice restaurant and was served cheese course on a large piece of slate. Six differents kinds of cheese,, of course couldn’t eat it all. Wish I could have taken leftover cheese home with me, but that is frowned upon. What a shame to waste all that wonderful cheese. 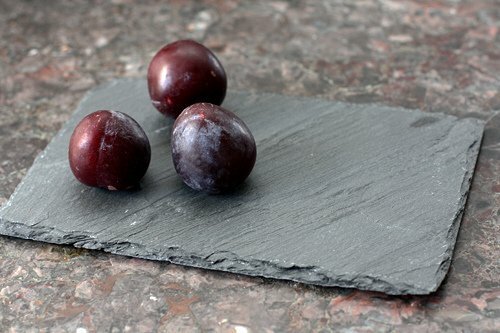 I would love to use slate for some of my food photography, would make a good background – colour, texture and all but am not I would want to eat off slate. In India, a slate used to be our first writing material in nursery school when I was a child. It was eco-friendly (no waste of paper/ trees) and child friendly as we carried no books to school, just a slate and and chalk! OMG, Slate plates! It’s so Flinstones. Or should I write, les Pierrafeu! I don’t have a problem being served appetizers on a beautiful piece of white marble, but I find the slate plates hideous and a poor way to serve a good meal. They look awful. For me, nothing beats simple white dinner plates (not those dinky salad-size plates substituting for real dinner-size plates) or beautiful china to serve a meal. Somehow, everything tastes better when eaten off of good china~~I love hear to hear the pretty bell like sound it makes~~Sounds like class and money to me! One of my daughter’s favourite eating places is a restaurant on the Isle of Wight (we’re still in England) s caled On The Rocks, where they serve the food on volcanic rocks- so you cook and eat your food on slate boards (or some sort of rock) and then eat it. So those waiters can thank their lucky stars that at least those trendy slate plates haven’t just come out of a hot furnace! I love plain white French bistro plates, the deep ones with large rims. They are perfect for making everything served on them look delicious and festive. I agree, this is silly. Well now I’ve heard of everything! The visual I have of watching a garcon reaching far across a table, trying to pry a flat piece of stone off of a flat table top, or the poor waiter with the teetering rock on the slippery plate is just too much! What a riot. La Petite Ardoise is my favorite brunch restaurant in Montreal where they use the ardoise to write the daily menu. Isn’t that what it’s supposed to be used for? I have no experience with slate plates and am not looking forward to it, but I loved this post and every comment herein. Ah. If only I had known a few years ago… I was trying to figure out something to do with the tiles that came off my roof. seriously, I too was rather puzzled when I saw this in Saveur a few issues ago. i suspect it’s the Spanish–hardly the Germans, where clay tiles are more common. what happens when men with bald pates play with quail eggs on slate plates and the nest all falls off the side and disintegrates? o, the Karen Carpenter reference just made me laugh out loud! You probably won’t be surprised to hear I had dinner in an upmarket restaurant in Sydney and the trend has come here too….I’m underwhelmed. i have slate in various sizes. have used them as cheese boards for a few years now. i like them because i can write the type of cheese on the slate like a blackboard. it looks very nice and i didnt pay a thing for them. i asked a client of mine who sold ceramic tile and other flooring products if he had any spare pieces he could part with and he gladly obliged me. i put some 1inch legs on the bottoms of each side which makes them easier to pick up…they clean up nicely and and they actually look rather feng shui and impressive. not sure if i would enjoy eating on them though…. I hate to think of what slate plates do to knives. Hm. I don’t especially mind slate plates for serving cheese – I think it’s a lovely, unfussy look. Steak (or anything else, for that matter), however? No. The thought of that sound (and the condition my knives would be in after repeated use) makes me shudder. As COASTERS though? I think there’s potential. I came across this company in a Tasting Table offer a short while back: http://www.brooklynslate.com/ but I’m still back and forth on whether or not to make the purchase. As Katherine points out, slate plates are nice for serving cheeses, crackers and grapes but I wouldn’t use them for serving a meal. They scratch easily. I bought one, 13 years ago at a Home Depot store for the purpose of sculpting into the stone to make it look like an ancient calendar relic. Time flew by and I forgot all about it until this fad came about. I can’t believe the current price for one tile! Mine was about $8.00. And so, I’ve decided to use it as a platter,…for awhile. The Brooklyn Slate co is an example of slate done well……magnificent in fact…. coasters, antipasto/cheese/sushi platters etc etc. They have thought of absolutely everything…. sealing the slate for hygiene as well as cork/felt tabs so that the board does not sit flat on the table. like most things in life its how its executed. sure beats a white, ceramic platter. we use Welsh slate roof tiles processed here in Sydney, Australia for our cheese events and we receive a huge amount of comments on how striking the visual is. I have no ide why anyone would scrape their knife along the slate…. that just seems daft. I much prefer your positive posts…. hopefully your pending trip to Australia and the sunshine will give you the boost of vit D you need to be positive and energetic again. Slate plates make as much sense to me as glass cutting boards. The sound of a knife scraping on either is cringe-inducing and I hate to think what it is doing to the knife. David, this is off your present topic but I was wondering if you have a recipe for a wonderful Honey Cake. With Rosh Hashana almost upon us I was looking for a recipe to make for my family. Over ten years ago, our daughter gave us a large rectangular sheet of slate. I love it! Use it quite often as a serving platter for nibbles before dinner. Very attractive to use and also very nice as a back-drop for food photography. Hey! I love Karen Carpenter’s singing! What a gorgeous voice she had. My appreciation was developed at a young age. In the 5th grade music class at Bowie Elementary, my teacher would pass out mimeographed lyric sheets, then put on the Carpenters record. What could be more appropriate than a bunch of ten year olds singing about how Mondays left them so depressed? Having waited on tables back in the day, I can safely say that slate would be a major pain- I’d pay the dishwashers to break ’em. I like them, for serving cheese. I might like a serving platter or two of slate, but to dine on? No, I think not. But the serving platter would match perfectly with the lovely matte black plates and bowls in my cupboard. Which I bought in fits and starts at Goodwill. Seriously, where would I get one or two of those things to park some rolls on? 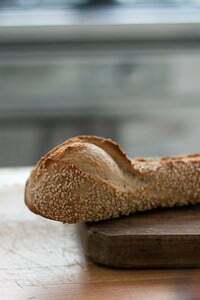 They might do well as warming rocks in the bread basket, too, yes? Slate sounds perfect for Le Boeuf sur le Toit special, but otherwise, non, merci. I can see how slate plates would not be ideal for the restaurant staff, but as a customer I find them interesting. Often we go “out” to eat for the experience, so something new is always nice. I wonder if they can be chilled or heated and would help keep the food at an ideal temperature longer, maybe? Did you actually buy one David? Is the one wrapped and then with the plums in your apartment, if so…. I bet you are planning on using it! Can’t imagine you would sacrifice the space ( and/or money) to just let it sit there. But I may be wrong…. From the safety/dishwashing point of view, I’m not sure how this differ from the usage of heating stone grills and bowls in many Korean and Japanese restaurants today. Also, no knives would be used to cut on them in these applications. As for the serving plates, it may be a trend that will eventually fade away in the name of practicality. paolita: I did buy this one. I was going to give it to a friend who also makes fun of the proliferation of slate plates. It was only €1.50 but I don’t think I can use it for anything after this. They’re overused as it is. 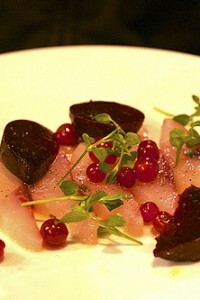 I just noticed an Iron Chef plating a dish on slate and thought it was clever. Clearly I need to get out more. Or maybe San Francisco just hasn’t caught on. In general, I agree with you. About 2, maybe 3 years, I was served beef (4 ways) on a piece of slate, at a rather high-end steakhouse in California (SF Bay Area). It was a nice presentation and I don’t recall it being too inconvenient or noisy and sometimes I will see the cheese course presented on a slate, but that’s about it. Like you said, it’s heavy and clean must be a total PITA. 1.50 Euros!!!!! I can’t believe I considered buying one for $14.99 plus shipping….. there went that. I am over it, thank you. Hmmm. my (dinner) plate policy is: white, round. I don’t like any messing with that formula! Watching our incredibly thin Toronto waiter bring our cheese plate to the table on an admittedly impressive-looking slab of rock brought all of us to our feet–it seemed he would get hurt putting the silly thing in the middle of our table alone! And here I thought this was just a hipster/Toronto trend…. I so totally agree with you. Along with the annoying flatness of them dressings and sauces also run off the sides of these fancy looking plater/plates.This creates pools on the table into which sleeves and elbows seem to be attracted. LOL The slate in your picture looks like what I installed in my bathroom walls. So not interested in eating off a piece of it. Like NRenee, I thought (hoped) this was just a passing Toronto fad. Though I do have slate coasters, which look great and which the dog can’t eat. From the other side… a pro-slate point of view. As the owner of a company that makes slate plates, trays and cheese boards I’d like to ring in if I may. The concept of a slate plate is a good one, the issue that you are running into is just like so many other things in life, the egregious overuse of a trend is annoying you. The truth of the matter though is that there is nothing ‘wrong’ with eating off a slate and you as a human were probably intended to eat off a rock and not a conglomeration of glass, porcelain, and plastic. :) The other issue is in your walk of life, you are coming across slate all too often, but in most people’s walks of life when you come across a slate plate it is a new and fun experience. So I think you may be a bit biased because of your ability to eat places we don’t get to. As far as the plates go, I have seen a lot of comments on here about the look, safety, etc. There are hundreds of different kinds of slate, so this is a valid question. The slate we use is naturally non-porous so food and bacteria can’t get trapped inside of it. 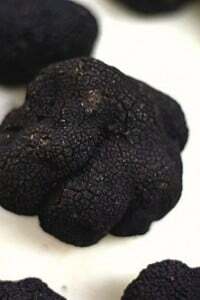 It is quarried in North America and is a deep, dark charcoal color. There is similar slate quarried in China and Spain, but the Chinese version is not non-porous and is also unfortunately the most common slate you see on the market (pretty much anything ‘pre-packaged’ in cardboard is Chinese slate). The Spanish version is good though and is commonly found in Europe. We also seal our slate with food safe natural oil which really just deepens the luster and keeps pretty much anything from sticking to it. So why do people use slate? The biggest reason that we have seen is the deep charcoal color which highlights gourmet foods and makes ordinary colors appear vibrant. The next biggest reason is because you can write on it with chalk (this pertains mainly to slate cheese boards). This allows you to label your cheeses so your guests know what they are eating and don’t ask you 20 times. We sell food-safe soapstone chalk for this, but you can also just use regular chalk. Size is an important factor too. Slate is very strong and thin so a 10″x20″ or 12″x16″ plate is completely stable. Likewise, you can go really small. For instance our slate is used in Aquavit restaurant in New York City in 3″x7″ sizes for bread and butter and then 12″x16″ for service trays. Next would be the less-known material properties of slate. For instance, slate is a natural conductor of heat and cold, so you can literally freeze your slate and serve cold items on it to help keep them cool or use your slate as a trivet for pots and pans or heat it to keep food warm on the table. I saw a comment on here about getting ice cream on a slate plate… that seems a little bit of a stretch for that server. Clearly the slates are perfectly flat so they do not work with foods that have thin liquids. They also are not good for things that require extensive cutting (like steak) because you’ll scratch the slate. I think the ‘fad’ of slate is probably a temporary one and the overuse you are seeing in European countries will subside (of course then we’ll get it in America, which it already has begun). I will say though that slate does truly make a unique, fun and alternative serving dish. I’ll also say that slate is a great tradition for serving cheese so that use shoudl not bother you. If anyone is interested in buying good quality slates, made by good quality people, we do sell them to the public, not just restaurants and we are proud of our products and proud to keep good people employed. You can visit our website at http://www.slateplate.com and we’re always happy to help with questions! Hopefully these comments have helped with some of your questions either way! Have a wonderful day! This is hysterical. I remember being served a number of slate plates during the summer of ’09 when I went to quite a few great restaurants in Paris and Provence, as well as the Basque country. Leave it to DL to pick up on this strange trend and write a post that causes us all to giggle and pause!